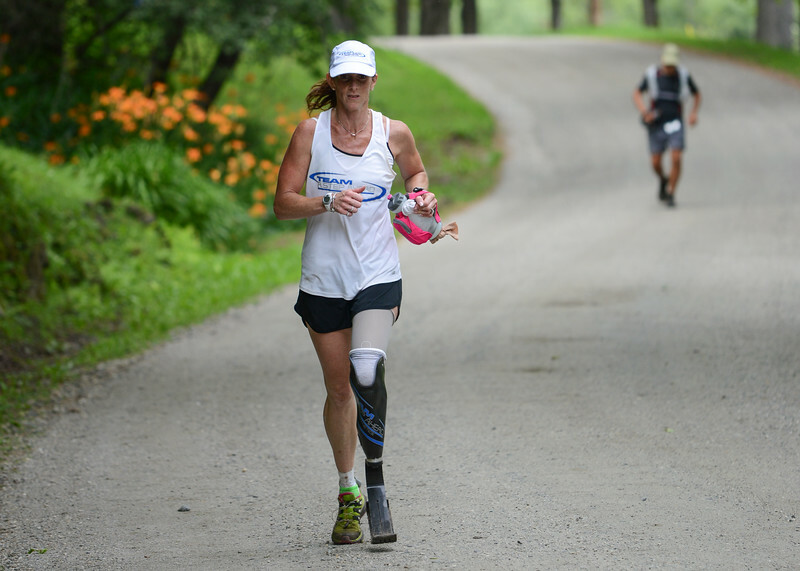 In 2017, the VT100 deepened our commitment to adaptive sports by becoming the first trail ultra ever to recognize mobility and visually impaired athletes in their own division: Athletes With Disabilities (AWD). This post will cover *everything you need to know about the AWD division, from entry criteria to division breakdown to racer and guide rules. *If there is anything you feel we miss here, please contact us in the footer contact form that follows this post. Since there are plenty of mucky Vermont trails on-course, it is not suitable for athletes in wheelchairs (see more on this below). AWDs must be able to finish within the 30 hour cutoff (100 mile) or 20 hour cutoff (100km). AWDs will follow the same registration process as the general registration, and will register for the distance race they plan to run. If an AWD requires additional time to register (e.g. due to visual impairment), contact the RD for early registration. Based on International Paralympic Committee impairment descriptions, the VT 100 will *recognize two types of AWD based on clearly defined eligible impairments: Visually impaired and mobility impaired. Course Markings: The Vermont 100 uses colored plates (yellow) to mark the course during the day and glow sticks (yellow) to mark the course at night. AWDs, with assistance from their guide as needed, must be able to follow the course as marked. Unfortunately, the Vermont 100 is not able make accommodations for athletes with visual impairments by altering the standard course markings. Canines: In general, dogs aren’t allowed at Silver Hill or at other venues associated with the VT100 (aid stations, race course, etc.). If an athlete with a visual impairment requires a guide dog, please contact Race Director for permission to have the dog at Silver Hill and the aid stations. Again, only at the start/finish grounds and designated aid stations. Dogs will still not be allowed on the course. AWDs will start with the rest of the athletes for their race (4:00am. for 100 mile, 9:00am for 100km). The course time limit is the same for AWDs as for all participants for their race (20 hours for 100km, 30 hours for 100 mile). AWDs may be accompanied by one guide at a time to complete the VT 100. Accommodations may be made if an AWD requires more than one guide at a time. Guides are not official entrants in the VT100 and are not timed, scored, or listed in the official results. If a guide wants to be officially timed, scored and listed in results, they need to register as a VT100 participant including paying entry fees and qualifying for the event. Guide may have a drop bag, separate from their athletes drop bag, at aid stations that allow drop bags. Guides are encouraged to attend the pre-race briefing on Friday at 4:15pm, however it is ultimately the AWD’s responsibility to attend the meeting and inform their crew and guides of all race rules/regulations. Assure that drop bags (the guide’s’ and AWD’s) are placed in the correct corral in the staging area, immediately following the race briefing. Work with AWDs to ensure safety of the AWD. This includes communication between the AWD and guide to stay out of the way (typically running on the side of the trail/road) when being approached from behind by horses, faster runners, or officials on the course in order to avoid collisions. Thank you for taking the time to read this post and get familiar with our new AWD division. At the end of the day, it is our hope that in disallowing extra time to complete the race (as well as other accommodations), we’re providing an opportunity for all abilities to compete on equal ground.